The ex-ANTARES has undergone a major 23 months total rebuilt and enlargement by its original builders Mondomarine, in Italy where everything was rebuilt including new propulsion engines. 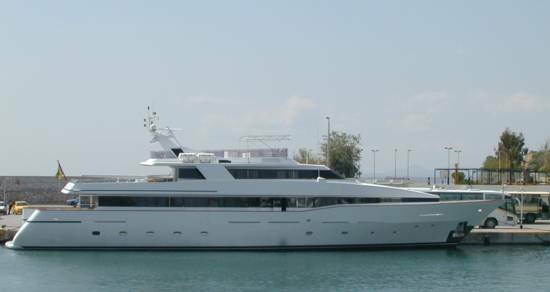 This yacht has been renamed TRINITY II and is now available for charter from May 2002in the East and West Med during the summer and the Caribean during the winter. A sleek and substantial yacht with great deck areas and an unusually spacious, beamy interior.The decor, combining creams and pale yellows with stylish blue furnishings, adds to a feeling of light and space. TRINITY II is an ideal yacht for charter. Guests are greeted by a wide aft deck with tables and chairs which provide a perfect spot for dining or for relaxing. Sliding doors open into an elegant saloon with formal dining area forward separated by a sliding frosted glass panel which secludes the dining area. 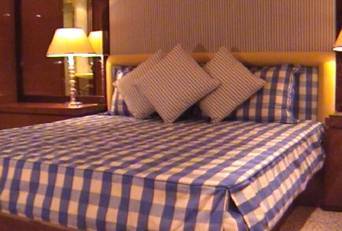 Accommodation for ten guests is provided in three separate areas. 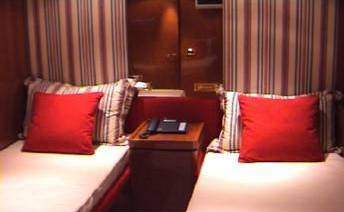 A substantial, full-width master cabin is located forward on the main deck, with its own office and separate dressing room. Stairs from the saloon lead down to two large double cabins on the lower deck one of which can be considered as a second master. 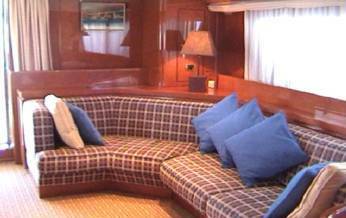 Both cabins are full width, and with bathrooms ensuite. One of which has a Jacuzzi. One of these cabins has a private lounge area with sofas which can accommodate one or two children if required. Steps forward of the dining area lead down to two twin cabins, both with en suite shower rooms. All en suites are fitted with Italian Carrara marbles, which is a special feature of the yacht. 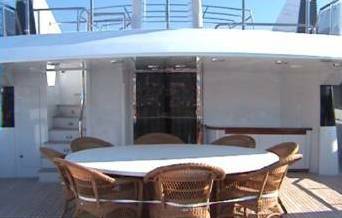 Dining for twelve is possible on the upper deck and the lower aft deck. Sun pads and two small tables/chairs are also located on the sundeck/ flybridge deck, which is the perfect spot for relaxing and observing the approaches to bays. With a full complement of water toys including one large brand new tender (SeaRay Bow Rider with 210hp).Also a smaller brand new Zodiac YachtLine Tender with 50hp and two Jet Skis and the latest in entertainment systems, TRINITY II is fully equipped to ensure a fabulous charter. The crew of the vessel has been hand-picked based on their experience in the charter market and their numerous references. 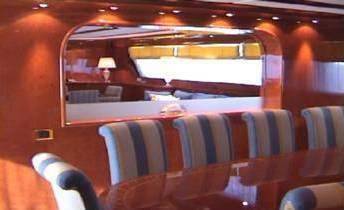 The boat will be presented in the Genoa Boat Show where you are very welcome to come onboard and have a drink with us around this beautiful boat. Crew of 7-8 in separate quarters.